For anyone who has read my blog over the years, you know that I am an avid race fan. I have been to the Japan GP for Moto GP (motorcycles) almost every year since I’ve been in Japan. I have also been to the F1 Grand Prix in Japan 3 times as well as Rally Japan in Hokkaido last year. This year, I decided to take a trip to Singapore to watch the F1 race. Singapore does not have the same history as Suzuka or even Fuji Speedway but it is quickly growing. The location has been likened to an Asian Monaco Grand Prix due to the similarities of a road course on narrow streets. Like Monaco, the race winds its way around historical buildings but unlike Monaco, the race also passes new modern buildings that were finished very recently, or are still being completed. 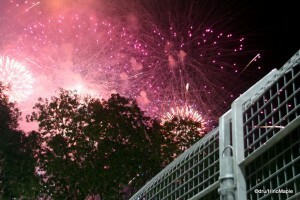 The Singapore GP has also built up a lot of entertainment for both casual and diehard fans alike. The run up to the Singapore GP lasts roughly a week before the actual GP. While the F1 circus probably doesn’t arrive until the Wednesday before the race, the event starts roughly 7-10 days ahead. Many of the shopping malls start by getting their decorations up and many shops have grand prix sales. It is an exciting time to just be in the city and you can easily feel it in the air. I didn’t arrive in Singapore until the Thursday before the race, which gave me three and a half days to soak up the atmosphere of the race weekend. At that time, everything was in place and things seemed to be running smoothly. Most shops had a minimum 20% discount on items. It was great to see and many shopping malls had outdoor shops of various F1 sponsors. 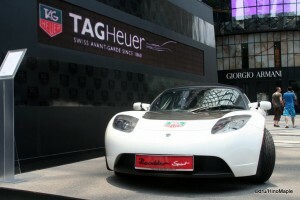 Tag Heuer had a portable shop erected outside a shopping complex in the Orchard district. Puma had a small container ship transformed into a portable shop located near one of the main entrances to the circuit. While walking around the various shopping malls, you would be highly likely to also run into a previous model of F1 cars on display. I only saw three, Lotus Renault, Force India, and Ferrari. I would assume that there were more, but I didn’t run into them and there was little to no information on where they would be. That is the only challenge when visiting Singapore during the F1 season, some of the public locations around the city are hard to find and you just have to stumble upon them. The actual circuit is split into 4 fan zones. Zone 1 encompasses the main straight and grandstands as well as the paddock. Zones 2 and 3 are located in nicer viewing areas, and Zone 4 is the general area at the far end of the track that is closer to the city. Most of the casual fans will flock to Zone 4. This is the largest zone with many viewing platforms, a few grandstands, and the concert venue. The entire weekend is filled with various concerts on each day. 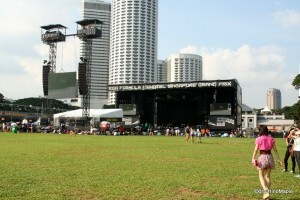 They set aside a large grass field and built a temporary stage at one end. During each concert, it is nothing but a sea of people in the entire field. In fact, I’m sure many people buy tickets just for the concerts, rather than the F1 race. Being more of an F1 fan than a fan of the musicians, I didn’t go to any of the concerts. By the time the race ended, I was too tired to push through all the people and barely watch a concert. I thought that by the time I walked from Zone 1 to Zone 4, the field would be completely full and I wouldn’t be able to see anything. Zones 2 and 3 are pretty boring to be honest with only a few entertainers roaming around. The only difference between the two zones is the fact that Zone 2 has one of the famous grandstands facing Marina Bay itself. These grandstands face a floating platform and the cars themselves race under the grandstands at one point. Otherwise, both Zones 2 and 3 are almost no different to Zone 1. Zone 1 is for the real race enthusiasts. It is where you will find all of the people hanging out waiting for the race. While both Zone 1 and 4 have F1 villages where you can buy merchandise, Zone 1 has better viewing platforms and it is around the most important corners in the race. I also found that more kids and families stayed in Zone 4 than Zone 1 and a lot more F1 merchandise was carried around in Zone 1. It was noticeable difference but not by a huge amount. The experience of the F1 weekend is something that I can’t explain. It is a thrilling and exciting event that must be experienced to understand. Every day is filled with people. The streets are filled with F1 enthusiasts just roaming around wearing their favourite team colours. Inside the circuit area, you can see so many people. After going to F1 at Suzuka and Fuji Speedway, I must say the level of noise in Singapore was much greater. They had “survival kits” for $2 each that contained a poncho and earplugs. On Friday, I was walking around and experienced just one practice session. At first, things were okay. My ears were fine and I thought it wasn’t bad until I headed up and crossed the track at one of the overhead passes. The scream of the engines were deafening and I could feel it shaking every cell in my body. I had to plug my ears just to keep them from ringing. I went to another location located under a bridge where the sounds of the engine echoed. It was so deafening that without plugging my ears with my hands, my ears felt as if they were starting to bleed. It was terribly loud due to the echo, but it was extremely fun. The other experience of the race that must be felt is how close you actually come to the track. In regular tracks, you are in grandstands that are metres away from the track itself. There is also a large runoff area for the driver’s safety. 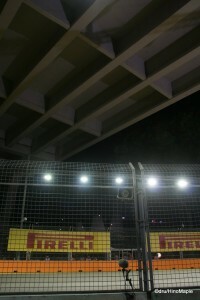 In Singapore, the track is narrow and the viewing areas are usually no more than a metre or so from the track barrier. It is exciting to see the cars miss a turn and probably more so to see them crash. I was not in a corner where a car had crashed, but I was in a corner where the cars missed the corner a couple times. It wasn’t bad but it wasn’t great either. In terms of the race itself, qualifying was a bit of a disappointment for me. I was hoping to see Kamui Kobayashi do well but he crashed out in the second round. The race was nice and interesting and the first few laps were exciting to see cars go through the turn two by two. I was camping out at turn 5 as I liked the position for photos. Things seemed to be going well and there were no problems at all, from what I could see. I heard a few things but didn’t see much as there wasn’t a TV screen nearby. Thankfully some people had Fanvision portable TVs and I could sneak a look from time to time. I wish I had spent money on renting a Fanvision as I would have been able to see much more of the action. I’m not sure if I would be as happy as I wouldn’t be able to use my earplugs, but who knows. If you don’t have a screen to watch the action, I would highly recommend a Fanvision in order to keep up with what is happening around the track itself. At turn 5, there really wasn’t much action happening for the entire race. Cars would go by really quickly and that’s about it. I enjoyed it a lot but had to guess what happened a little when Michael Schumacher crashed into Sergio Perez and brought the one yellow flag of the race. I also couldn’t tell when the race would end either. It was a difficult time to keep track of the race but in the end, Sebastian Vettel won the race with Jenson Button in second and Mark Webber in third. As of writing this entry, Vettel is leading the championship and needs just 1 point to win it. Jenson Button is in second and needs to win every race to win the championship. It is more than likely that Sebastian Vettel will win the championship in Japan on October 9th. All in all, the race was a great experience. It was the best race I had ever been to, albeit I have only attended 3 races in my life now. It could be a combination of a vacation and how close I was to the actual action. Singapore really knows how to throw a great party and they should be patted on the back for it. I am reminded of a story about the Olympics themselves. When I went to the 2010 Vancouver Winter Olympics, everyone, including foreign media, reported how much fun it was to be in the city. It was a real party atmosphere. When people went to the 2008 Beijing Olympics, they said it was a great event but outside of the event it was very boring. When going to the races in Japan, I found it to be more alike Beijing than Vancouver. While the location of the course itself is partly to blame, I feel that having more F1 related activities in Nagoya or Osaka could help a lot. The same goes for Moto GP. They cities near the events need to make it a destination in order to bring people in and keep them in. Doing so would help increase the number of visitors as well as people who visit the area for more than just a passing weekend. 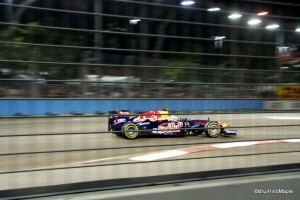 The Singapore Grand Prix is a race I would love to see again, but not sure if I’ll do it anytime soon. You will get a race that is held at night so that you can enjoy the city by day. 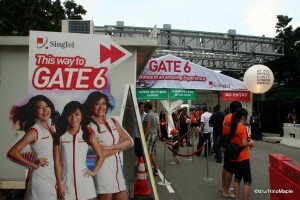 You can party it up with all of the F1 related activities both inside and outside of the circuit itself. It is a non-stop weekend that I highly recommend. This entry was posted in East Asia, Motorsports and tagged F1, Formula 1, Formula 1 GP, Formula 1 Grand Prix, Formula One, Formula One GP, Formula One Grand Prix, Grand Prix, Japan GP, Japan Grand Prix, Marina Bay, Monaco Grand Prix, Orchard, Puma, Singapore, Singapore GP, Singapore Grand Prix, Singtel, Singtel Singapore, Singtel Singapore GP, Singtel Singapore Grand Prix, Suzuka, Tag Heuer by Dru. Bookmark the permalink.